The 10th beer in Founders infamous "Backstage Series" is the first lager they've brewed in over a dozen years. Dissenter is an Imperial IPL coming in at 8.70% brewed with "a variety of tropical, citrus-forward hops". Being from Massachusetts and having year-round access to Jack's Abby has opened my eyes to what you can do with a lager, so Founders has to do some work to impress with a style they aren't familiar with. Pours to a gorgeous, glowing orange. It's very clean and clear and gave a one-finger head which sticks around nicely. This is a very hoppy lager. Tons of tropical juices explode on the aroma. An explosion of bitter hops and citrus on the taste. It has such a hop presence that it could compete with a lot of IPA's. the citrus notes make it an easy-drinking lager. The mouthfeel is slightly thicker than I had anticipated and the finish, while bitter, is rather clean. 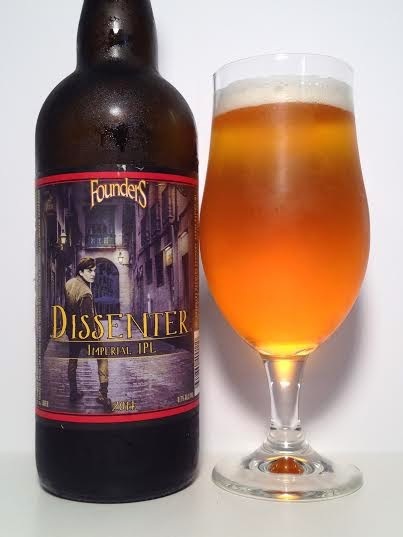 Founders Backstage series has become hit-or-miss as of late, but I really enjoyed Dissenter. It's clean, it's fruity, it's hoppy, and it's drinkable. There's nothing more you want in a finely-made lager. If this was a year-round offering it would find regular rotation in my fridge.